I am back! Well I was actually back late, late Sunday night. Been trying to catch up on other things, relax, and spend time with my boys. I had such a great time at the Diva Delight. Sold some stuff and met lots of great people. I was so happy to see how much people loved the Plastic Projects. 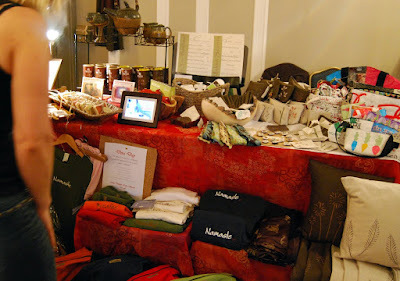 I shared a table with Serena and as you can see it looked pretty amazing with all our products. 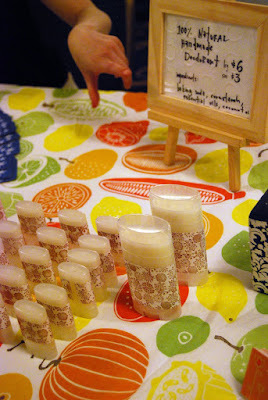 Jeanie was there too selling some of her awesome natural, handmade deodorant. I totally recommend it if you can get your hands on some. Really good stuff! This was so much fun. I'm definitely looking forward to doing some other shows in the future. Now to prepare for "a how to make a plastic pouch" session for the Diva Day at Thrive! Naturally happening this coming Sunday. I'll be showing a bunch of lovely women a step by step class to make a wristlet, snap button, plastic pouch. This will be my first class ever and I'm soooo excited! And no I didn't forget about this month's printable. Just been sooo busy. Hopefully I can post it up tomorrow. So stay tune!! On that note, having a printable every month doesn't seem possible anymore. Sigh, I love to do them so much too. I guess it will be "Surprise! It's a Printable" instead. Haha!